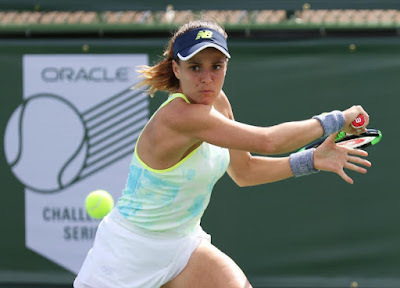 Ex-Stanford star Nicole Gibbs, who revealed in January that she struggles with clinical depression, defeated Han Xinyun of China 6-1, 6-4 today in the first round of French Open qualifying in Paris. Han, a 27-year-old left-hander, had only three winners and 25 errors. Gibbs, seeded eighth, is scheduled to play Veronika Kudermetova of Russia on Thursday. Ranked as high as No. 68 in 2016, the 5-foot-6 (1.67-meter) Gibbs has dropped to No. 114. "When you're not inside the top 50, tennis is a constant identity crisis," Gibbs, who turned 25 in March, told the Telegraph of Great Britain in January. "You ask yourself questions all the time. What can I be doing to do better? Am I doing everything I can? How do I get to that next level where I really want to be? There were times when the up-and-down elements of tennis made things almost unbearable for me." Gibbs, who won two NCAA titles in singles (2012 and 2013) and one in doubles (2012) before turning pro one year early, seeks her third main-draw berth at Roland Garros. She lost in the opening round to Alexandra Dulgheru of Romania in 2015 and to Heather Watson of Great Britain in 2016. Canada's Carol Zhao, the 2015 NCAA runner-up, was tied with 37-year-old Francesca Schiavone, the 2010 French Open champion, at one set apiece today when their match was suspended by rain. Bradley Klahn, the 2010 NCAA singles champion from Stanford, lost to 28th-seeded Henri Laaksonen of Switzerland 4-6, 7-6 (3), 6-4 in 2 hours, 15 minutes in the opening round of qualifying. Only two of 11 U.S. men, Denis Kudla and 6-foot-11 (2.11-meter) Reilly Opelka, survived the first round of French Open qualifying. Opelka, 20, won the $125,000 Bordeaux Challenger on Sunday for the biggest title of his career and his first on clay. He became the first American in the 11-year history of the tournament to take the crown.